March 3, 2016. Tim Lewis checking in as the new owner of Sandpiper. 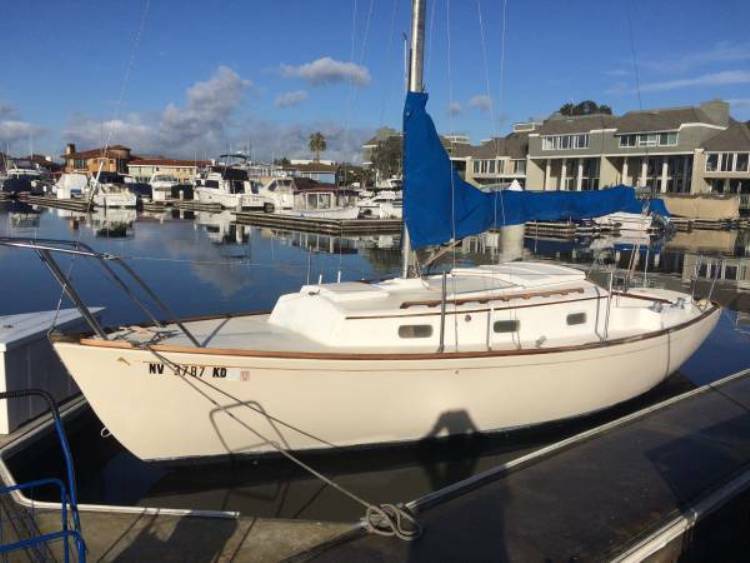 I saw this boat on Craigslist, then did a little research and came across your website. It is the Sandpiper and now she resides in Long Beach, California. 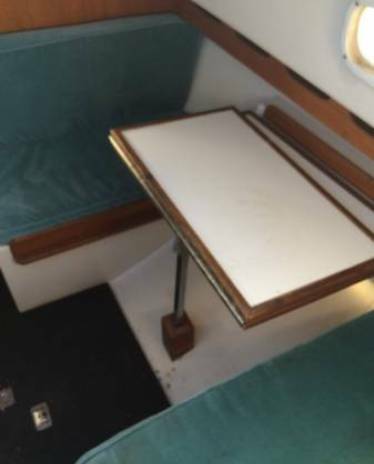 I am relatively new to the boating world and having a bit of trouble locating a ladder for my boat. The seller gave me a ladder to affix to the back of the boat but I just didn't like the idea of it not being where it was intended to be. It appears the ladder would be on the starboard side of the boat and hook into 2 metal fixtures. It appears original. Do you know where I can loacate a ladder that would snap into the side? Here's a photo of the fittings. This is the story we had on Sandpiper up to this point. 'Landon' was the former owner. February 4, 2016. The Craigslist ad was updated on February 2nd - price is now back to $4000. 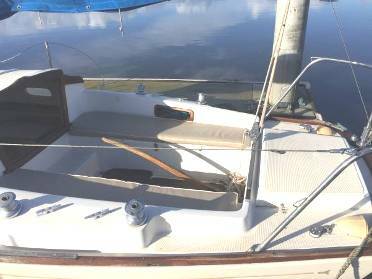 January 30, 2016 Billie Williams sent us an email after seeing Sandpiper and would be willing to talk to others interested in this boat. Here is the updated Craigslist link https://orangecounty.craigslist.org/boa/5405013037.html. There is a lower price - now $2000. I've seen the boat. It's very clean. 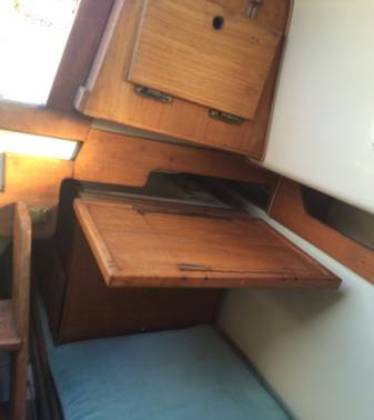 The wood toe rail has some issues but they appear to be cosmetic - the sails are original (!) and about to fall apart. Landon put on a different main but I haven't seen it. The outboard runs. Standing rigging looks clean. Turnbuckles did not show stress, but I'm not an expert. Running rigging is shot. 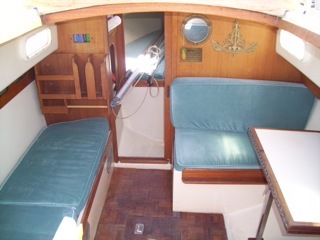 Down below is clean, in good condition and has the moveable galley. Landon (current owner) is in the marine salvage business and I'm concerned that the boat will be scrapped soon if someone doesn't buy her. I'd hate to see this little sweetheart scrapped. It's just not quite the right boat for us at the moment. I'd be happy to talk to anybody about what I saw. September 12, 2012. Maudie Robinson advised that Sandpiper was sold in January. Hopefully the new owner will check in. May 18, 2010. Maudie Robinson checked in with her Sandpiper, #264 - our 156th found Dolphin. Here's her email and photos. 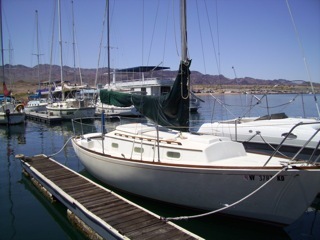 We've owned Sandpiper,Hull #264 built in 1976, for 15 years, and she is still in beautiful shape although the lines are a little worse for wear because of the hot summers at Lake Mead here in Nevada. My question is whether anyone has a plan of the drain system for this particular model? We've never had a problem with water filling the bilge until this year when we had more rain than usual. (Your webmaster has responded with the usual list of suspects - check seacocks and other below waterline fittings, centerboard control line pipe, cockpit and seat drain hole pipes/hoses, seals on hatches and portlights, wash boards fit, hawse pipe for anchor line, telltale water mark/rust stains anywhere in the inside of the hull, water tank leak, sink drain leak) We had the bottom cleaned recently to be sure the paint was still active, and have been reassured that there is no blistering. We were considering selling the boat because we haven't used it as much in the last few years, but after spending a few days at the lake getting her ready, not sure we're ready to part with her just yet. I'm attaching a couple of pictures for your "library" and would love to hear from anyone who shares my admiration for this wonderful little sloop. Thanks, and thanks for this website, too. 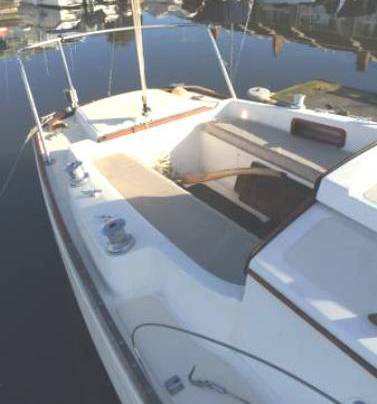 ps We purchased Sandpiper in 1995 from a woman who had owned her for ten years, who bought her from a someone who had owned the boat for ten years which makes us only the third owner in 34 years. We were told that Sandpiper is the original name -- we wouldn't dare tempt disaster by renaming -- and she has always been in fresh water so far as we know.